More proof that Manhart is one of the best BMW tuners in the business. 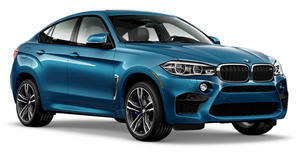 The BMW X6 M SUV is certainly no slouch, packing 567-horsepower and 553 lb-ft of torque from its burly biturbo 4.4-liter V8 which helped it set a Nurburgring lap record, but some of its rivals in the performance SUV segment are starting to overtake it. Enter German tuner Manhart, renowned for being one of the best BMW tuners in the business. Manhart has injected the X6 M with a healthy dose of testosterone to help it keep up with the competition. Dubbing its monster creation the MHX6 700, Manhart has transformed the X6 M into a scarily fast SUV. By adding a new ECU map and exhaust featuring 300-cell catalyst downpipes, the MHX6 700 boosts the power of the X6 M up to 690-hp and 664 lb-ft of torque. No sprint time was given, but you would expect it to be around four seconds given that the standard X6 M can reach 0-60 mph in 4.3 seconds. H&R lowering springs reduce the ride height by a few inches. MHX6 700 also adds a bespoke bodykit to make the X6 M appear more muscular, but it isn’t as brash as you might expect for an SUV that packs such serious power. New carbon fiber components include a custom hood with larger air intakes, while a new lip spoiler and diffuser accentuate the rear. It rides on an intimidating set of 22-inch split-spoke wheels wrapped in 295/30 and 335/25 tires. The BMW X6 is likely to be replaced when the new X5 arrives on the scene, so this could be a fitting send-off for the SUV.